I'm honored to have been selected to participate in "Shelter", a juried exhibition for Audubon Center at Debs Park. Selected artists will create outdoor art installations among the Center's trails and wildlife habitat. Paying homage to Audubon's committment to bird conservation, my installation is designed to be viewed through binolculars. A rough sketch is shown above. Similar to anamorphic sculpture, this installation takes on different form and meaning when viewed from different perspectives or investigated through binoculars! 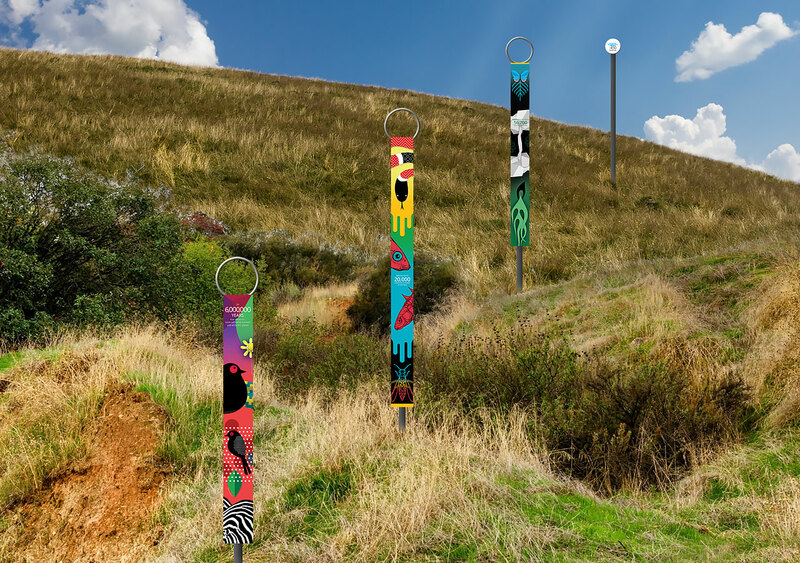 From afar, hikers see brightly colored posts decorating the hillside. Coming closer, as their visual perspective of the installation changes, viewers realize the posts align vertically to form a straight line of cohesive imagery all the way up to the hilltop. 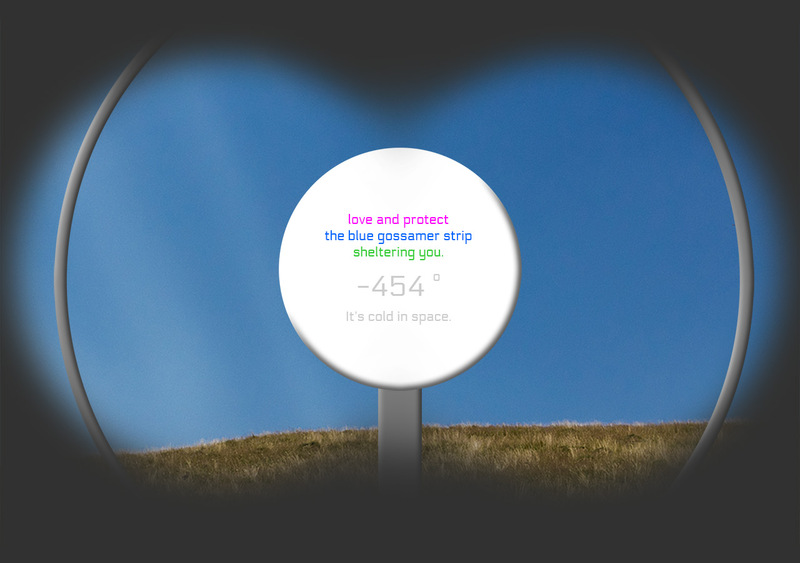 A ring atop each post aims the viewer’s gaze by framing a “hidden” message on the next post. Birders and children with binoculars are enticed to peer deeper, revealing pearls of wisdom. Meaning culminates at hilltop with a simple message of hope and love, strategically positioned against bright blue sky, calling us to protect one of mother earth’s most fragile and precious gifts to us‐‐ the atmosphere—which shelters and enables life on earth. Humans, along with all creatures, depend on our common sheltering sky. Our atmosphere makes life possible here on Earth, not only providing breath, but also sheltering us from ice‐cold outer space, UV rays, solar flares, meteorites and more. Our shared atmospheric shelter is a molecular dance of extraordinarily balanced chemistry. This delicate balance lives in a thin blue gossamer strip 1/100th the thickness of our planet. With each breath, you receive oxygen molecules released by plants, sustaining your life. And with each exhalation, you give back carbon dioxide molecules those plants reabsorb. Together, plants and animals form the lungs of the world, and for millions of years have maintained the molecular equilibrium comprising Earth’s atmosphere. Deforestation threatens this delicate balance. Without broad leaves in old‐growth forests, the carbon dioxide we release through breath and pollution can’t be reabsorbed through plants. The same forces driving species to extinction by habitat loss, threaten our atmospheric shelter with rising C02 levels. The art installation is designed for easy installation with minimal physical disturbance of environment, with intention of exhibiting at the Sepulveda Basin Wildlife Reserve and other locations after the Shelter exhibition closes. After being displayed, each decorative post could be auctioned with proceeds donated to Audubon Society. I’m a seasoned, disciplined installation artist who leaves no trace behind. Habitat and soil will show no sign of my presence after the show.